After a government review established seven actions to support the health of the UK’s refining sector and to ensure our fuel supply resilience, the sector is receiving increased attention. But, will the new Midstream Oil Task Force be able to fulfill these actions? Reflecting the government’s position on refining, the statements below are taken from the ministerial foreword from DECC’s recently published review into refining and fuel imports. Oil demand will reduce in the coming decades, but by 2030 the UK is still expected to consume some 50 million tonnes of oil products per year, compared with 61 million tonnes today. It is clear then that there is an important role for both refiners and importers to play for many years to come. The refining sector faces a challenging future. 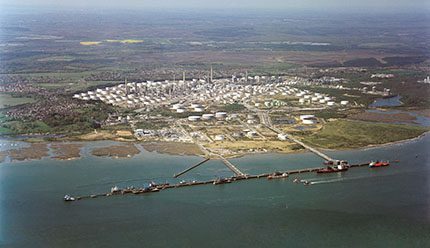 In 1975 there were 19 refineries in the UK; today there are 7. The UK government believes that a mix of domestic refining and imports is good for energy resilience, good for the economy and good for jobs, and wants to see both continuing to operate in the market. The review followed DECC’s call for evidence in May 2013 on the role of the UK refining and fuel import sectors. This prompted a report from the Energy & Climate Change Parliamentary Committee in July 2013, which concluded that having both domestic refinery production and imports is important to energy security, and that the government should ensure that both sectors can operate on a level playing field in the UK. That same committee suggested that the government should identify ways to incentivise investment in UK refining and set out its long term intentions for the sector to give industry confidence. Operating in an environment of continuously difficult conditions, the refining sector is not configured to meet the current pattern of market demand. With 44% of diesel and 64% of Jet A-1 requirements having to be met by imports, the government’s attention to future supply resilience is well founded. Resilience – is there sufficient capacity in the supply system to meet demand, allowing for fuel to be provided to UK consumers at a globally competitive price? Economic – what contribution do refineries and importers make to the UK economy? The sector as a whole was assessed to amount to £2.3 billion to GDP, £366 million in total tax/NI revenue and £36 billion in excise duty & VAT per annum. Social and environmental – about 30,000 jobs with a generally high skills profile are currently provided, directly and indirectly, by a sector cognisant with the health, safety and environmental regulatory framework within which it operates. The report considered that the UK fuel supply sector, as it is currently structured, performs well against these criteria. Refiners have access to crude markets and also provide a source of product within the UK itself, while importers help to mitigate the supply-demand imbalance for diesel and aviation fuel, being able to provide a rapid and flexible response to supply disruptions. Wholesale UK road fuel costs are among the lowest in Europe, demonstrating the efficiency of the supply chain. A new joint government and industry Midstream Oil Task Force will be established to drive forward actions. The task force will promote a strategic and collaborative dialogue and means of working between government and industry. Independently chaired, it will report into DECC ministers with DECC providing the task force’s secretariat. Starting in summer 2014, meetings will be held quarterly with government responsible for delivery of outputs. To assess the extent to which pipeline access is a problem for the sector. Could this be improved by the development of a voluntary code of practice on third party access or other action? Recommendations are to be made by the end of 2014. To evaluate the costs, benefits, risks and value for money of action to address other market distortions and promote infrastructure investment. Government will make recommendations by autumn 2014. In collaboration with government and regulators, the midstream oil sector to identify opportunities for making regulation smarter thus reducing the regulatory framework’s impact on the sector. The task force will agree scope and timetable by autumn 2014 with initial recommendations by January 2015. To assess whether (a) existing levels of obligation to hold emergency oil stocks – placed on companies under the UK’s Compulsory Stocking Obligation (CSO) – are sufficient to ensure the UK remains compliant with its international obligations now and in the future, and (b) whether the current balance of obligation and costs between refiners and non-refiners remains appropriate. The outcome of DECC’s consultation on Future Management of the Compulsory Stocking Obligation in the UK (published April 2014) will be a key input in to any government decision, made by year end. To establish an industry-owned and operated central stocking entity to manage the UK’s CSO. Obligated companies are to prepare a roadmap for the entity this year. If this is acceptable to government and parliamentary time is available, an appropriate legislative vehicle will be sought by government to take it forward. On an ongoing basis, the government will continue to work with the European Commission and other member states to ensure the EU Refining Fitness Check process is completed urgently and that it delivers clear and decisive actions to remove unnecessary burdens. UKPIA welcomed the review and the proposal to establish a task force to tackle some of the challenges identified, but felt that it did not fully address many of the wider legislative issues affecting the UK’s refining sector and its ability to compete effectively in today’s global market. The trade union UNITE commented that the review failed to reflect ‘reality, expressing concern about the country’s energy security in the light of recent years’ and threatened refinery closures. Ultimately the success of the review will be determined by the fulfillment of the seven government identified actions and the impact of the proposed task force. There is no ready formula to establish the optimum balance between indigenous refining and product imports to meet UK market requirements except possibly, on a point in time basis. The key question is how best to satisfy the evolving/changing pattern and levels of product demand, including export markets for surplus petrol, mindful of considerations of energy security, supply resilience and competitive product’ cost. The task force will have its work cut out!